She stepped back as though he’d struck her. He held her wide-eyed gaze, refusing to regret his words. Sharon turned from him to lift her oversized purse from the floor. She pulled the strap over her shoulder. “Thank you for your time.” She turned, back straight and head high. Long strides carried her from his office. Matthew’s temper chilled with the realization he’d just crossed the media. In a normal situation, he would welcome the attention of an intelligent, attractive woman. But, circumstances as they were, this woman’s interest could burn him. Sargeant’s scrupulous research coupled with terrific writing makes this a sensational and engrossing story. Mistrust, confusion and anger are balanced with humor and sexual tension as a fire investigator and a newspaper reporter teeter between love and hate. Sargeant pens such exhilarating novels, her literary career is surely on fire. – Shon Bacon, ChickLitGurrls (http://chicklitgurrl.blogspot.com). 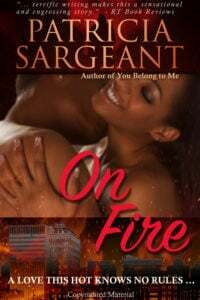 It’s not often that I read romance novels, but I was more than happy to have read Patricia Sargeant’s latest – On Fire – a novel full of drama, strong characters, and friendships and loves that I found engaging. On Fire introduces us to spit fire reporter Sharon MacCabe and wary, new Fire Captain, Matthew Payton. Sharon has climbed ring after ring in order to finally be seen as a serious investigative reporter. In an instant, she finds her precious job snatched from her and must watch as a senator’s nephew takes her job and the story of a lifetime: a series of arson fires-turned-murders. Losing her position doesn’t stop Sharon from conducting her own investigation on the case, but before she can get an “in” for the investigation, she must get in with Matthew, a man who has been burned by media in the past and who still carries the pain of losing his sister and being accused of setting the fire that took her life. Payton finds himself drawn to the feisty reporter despite his past hurt, and reluctantly, he joins Sharon on the quest to solve the arson fires and murders. As the pair find themselves growing closer – to each other and to finding a suspect – their lives are threatened by someone fighting to keep the truth of the murders hidden. My favorite thing about Sargeant’s novel is Sharon MacCabe. She is a strong female character throughout the entire novel. She does everything fast and furious, and even when things interfere with her life, she keeps on keeping on. I also enjoyed the fast pace of the story. Sargeant does a great job in keeping the energy up, the drama intense, and the growing relationship between Sharon and Matthew hot. The intricate detailing of suspense was equally engaging. At every turn, I thought I knew who the culprit was, but Sargeant surprised me every time. On Fire is not just a romance; it is a suspenseful thriller, a novel that shows the pains one will take in order to achieve prestige and power. If you are a reader who enjoys romances laced with suspense and features strong, fearless women, then you definitely want to give Patricia Sargeant’s On Fire a read.